For those not familiar, monome is the brainchild of Brian Crabtree and Kelli Cain that just happened to launch the grid-controller paradigm. The minimalistic design of the hardware features rows of identical back-lit buttons and makes do without labels, knobs or LCD-screens. The original 8x8 grid-controller has inspired a host of hardware by the likes of Yamaha, Novation, Akai, and of course our own Push. Since its emergence in 2006, monome has grown a thriving open-source community whose users continue to explore and extend the hardware's capabilities with software primarily built in Max/MSP. Well-known fans of monome include Flying Lotus, Imogen Heap and the LA-based producer Daedelus – watch one of his energetic performances below. And now with the recent release of terms, an essential collection of monome apps are super easy to set up in Live. Based on sum, terms contains eight Max for Live devices which together create a complete performance system for the monome grid within Live. A cyclic poly-rhythm music box, a step sequencer and a powerful FM synth (which can be used by all Max for Live users) are just a few of the essentials inside. Download terms for free here. 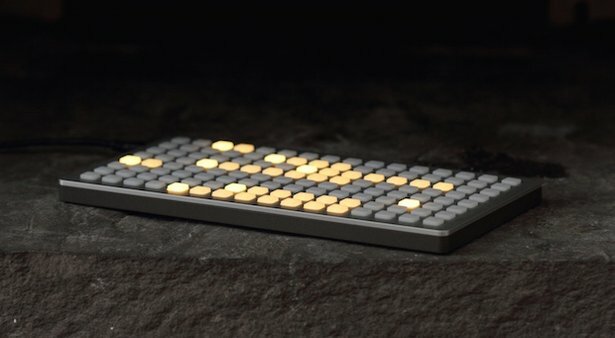 Learn more about monome on their website.